Werner's Cairns blog: Cairns will be Fluoride Free, common sense prevailed. Cairns will be Fluoride Free, common sense prevailed. The Cairns Report – a week to remember. On Wednesday morning the 30th of January 2013, Merilyn Haines (President Queenslanders for Safe Water , Air and Food Inc.) rang me and told me that the Cairns Regional Council is voting on water fluoridation and that I should go there. I didn’t know that this particular meeting was on and, although I already knew the outcome by talking to the councillors in the preceding weeks, I decided to go. When I arrived there, I was told that the meeting started earlier and is in progress and in its dying moments. I was able to witness the voting, and enjoyed clapping when the result was announced. For me, that was like a dream come true, I never thought that this would ever be possible. Cr. Linda Cooper and Cr. Jessie Richardson came to me, we shook hands and I congratulated them on their decision. Then the meeting was closed and we had to leave the chamber. The Councillors who voted to stop this insidious practise deserve a feather in their collective hats. This was a courageous decision, especially since we have the pro fluoride Cairns Post, the pro fluoride radio host John Mackenzie of radio 4CA, pro fluoride TV channel 7 and of course the biased dentists with “blinkers.” The latter of course are still grateful to Anna Bligh for paying the Queensland branch of the Australian Dental Association $220.00.00 for being compliant and supporting it. Here is what a Smithfield dentist said to her client, Esther Czedik, from Holloways Beach (Cairns) I quote: “Fluoride only helps young kids and has no effect on adult teeth - those kids who come for regular check ups to see him don't need fluoride anyway because they do take care of their teeth - The problem is purely the SUGAR. - Those who don't eat / drink much sugar, they have healthy teeth and don't need any additional fluoride. Unquote. Esther also suffers from thyroid problems from ingesting fluoridated water. Esther will be more than happy that Cairns water will be free from silicofluoride. Blight he former Queensland premier said that to implement fluoridation will cost $39 million, by the time she was kicked out of office the cost had skyrocketed to $113 million. What a flagrant waste of public money for something that was known not to work. 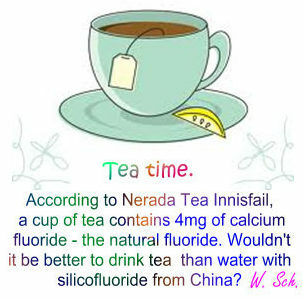 Drink tea it is cheaper than silicofluoride and healthier. As soon as I stepped outside the Council Chamber the Channel 7 TV crew approached me for an interview. I answered all the reporter’s questions and told them why I was against fluoridation. I especially stressed that this is a man-made toxic poison from the Chinese fertiliser and aluminium industries, and that we dispose of it through our drinking water system, yet the Chinese prohibit water fluoridation because of their health concerns. After they were finished with me, they asked Bill Kilvert, North Queensland coordinator for Queenslanders for Safe Water , Air and Food Inc.) to talk to them. Bill said: “Werner said all that needed to be said.” But they insisted on interviewing him. At the 6 o’clock news they showed a picture of me with my name and all I said was: “It is a man made poison and should not be disposed through our water system." Bill didn't make it to the TV screen. It showed which side they are on. Then I was bailed up by Daniel Strudwick from the Cairns Post and we had a lengthy talk and he recorded all of it. The next day, in his lengthy article nothing was mentioned of what I said, but he published mainly what the proponents of fluoride said. Of course, we all know that the job of the editor is to separate the hay from the chaff and then publish the chaff. On the way home I listened to radio 4CA on the car radio. There John Mackenzie and the member of parliament for Cairns, Gavin King were lamenting the decision of the Council, I was shocked and so were many other people as I learnt later, one of them was a prominent Cairns Chemist. They were absolutely astounded that those two were pro fluoride. I was gobsmacked to hear a dentist ramble on and on about this dreadful decision, he stopped short of saying the sky will fall down and all the teeth of the young people will fall out. (The latter don’t drink water) But when he said that fluoride is not a poison (he didn’t say silicofluoride), but a natural compound, I said OMG, what an absolute dill. I thought, he doesn't know what he is talking about. However, he wasn’t alone in not knowing what he was talking about; Gavin King MP and John Mackenzie were in the same league and singing from the same song sheet. I was anxious to go home and get on the radio to debunk some of the rubbish King and Mackenzie was spruiking. Well, I got on the radio alright and most of you happen to know what happened after a short while – I was cut off, those two uninformed creatures didn’t like to hear the truth. I was inundated with congratulatory e-mails and phone calls for tenaciously fighting this insidious practice undemocratically imposed on us. But I was not alone fighting this and I didn’t do it for getting accolades, I was fighting it because it was wrong and undemocratically imposed on us without any consultation. And, I also know a lot of people who suffer health problems by ingesting fluoride, but the fluoride proponents didn’t care one iota about those people – I can only say: shame on you and that is an understatement. I can list many reasons why my wife and I opposed water fluoridation, but I will only state here one of the reasons. The Tasmanian statistics alone should tell the fluoride proponents that water fluoridation doesn't work. I quote: “Despite over sixty years of water fluoridation, Tasmania has the highest level of permanent tooth decay” (Australia Institute of Health and Welfare, 2007.) and the highest percentage of edentulous adults of the nation. (Anglicare Tasmania 2003. Unquote. The countless people who rang me or e-mailed me were absolutely shocked and disgusted with Mackenzie and King and there were a few I know as members of the LNP who said that if D.J. Hunt of the Katter Australia Party will stand for the seat of Cairns at the next election, they will vote for him. It is a well-known fact that D.J. is vehemently opposed to water fluoridation. But many also would want Mackenzie to go and be replaced with Greg Cary who filled in for Mackenzie while he was on holiday and according to them did a better job and never showed bias. I wonder how Gavin King can reconcile with Michael Trout and the Barron River Branch of the LNP - they are absolutely opposed to water fluoridation. There is of course a big difference between Michael Trout and Gavin King, Michael is willing to listen and learn, Gavin King thinks he knows everything. I remember well the day when Michael was door knocking in Yorkeys Knob before the election and dropped in for a drink and a chat. Our eldest daughter Sonja Hardy and husband Bob were here on a visit. Sonja and I told Michael to fight to stop water fluoridation if he gets elected and we informed him of the evils and ineffectiveness of water fluoridation and why most European countries don’t fluoridate their drinking water. We talked for more than an hour; Michael asked questions and was listening intensely to what we had to say. Before Michael left he said to us: “I want to be honest with you. I knew absolutely nothing about fluoride, but now I do and I will certainly fight for the abolition, if elected. The rest is history. Now this is the difference between an aspiring politician who is willing to listen and learn, compared to the ones who know everything, and don’t want to listen to reputable scientists and expert in the field of chemistry and toxicology - to find the truth. "With respect to the amendments, I cannot allow this opportunity to pass without quickly putting on the record for the benefit of those involved, especially those who have lobbied me heavily in my electorate, some of the strong thoughts that I have. I mention in particular Sonja Hardy from the Springwood electorate and all the lobbying that she has done on the issue of choice with regard to fluoridation. I would like to mention and put on record my appreciation of Jason Woodforth MP Michael Trout MP, Rosemary Menkens MP and Steve Bennett MP for the work that they have done in working within the party to raise this issue of choice. After all, the people simply want choice rather than copping sweep mass compulsory medication. Unquote. We need more politicians like the above mentioned who are willing to listen to their constituents, and are willing to get informed on issues they know little about, and most of all; we don’t want puppets on a string. And, Gavin King, make hay while the sun shines, from the feedback I’m getting, you will not be the member for Cairns after the next election. We supported Gavin King through the Cairns Post when he was attacked before the election, I sent him fluoride information, I know now that he has never read them – he has disappeared from our radar. *Want to make a comment? Read the annotation. Congratulations Werner. The people of Cairns should be so thankful to you for all your hard work to achieve this wonderful result. I will circulate your "Cairns report". This has been really great news Werner and Karola. Nik is especially relieved - it is great that this has recently been overturned , finally. Congratulations, Werner, you have been responsible for this result in no small way. Your tenacity over many years has finally paid off, and a lot of Cairns people will be ever grateful to you. 1. Any preventive, diagnostic and therapeutic medical intervention is only to be carried out with the prior, free and informed consent of the person concerned, based on adequate information. The consent should, where appropriate, be express and may be withdrawn by the person concerned at any time and for any reason without disadvantage or prejudice. What part of this is not understood by the medical and dental profession? Thanks for all your efforts to free us from Fluoride. The effect on our health had me worried!!!! Well done Werner! Congratulations and thanks for all the work you put in, educating the public about the evils of fluoride. You did a fine job, and now, finally we have the right result. I've been looking to do a story on Fluoride lately and it would be great to include this in it. Thank you for your efforts. If only we can win this fight on a large scale like Brisbane. That should really be the next goal. Great work, great article! Thanks on bealf of all of us @ www.facebook.com/fluoridefreeaustralia . You give the rest of us hope! Well done to Werner and others who worked so tirelessly to prevent this awful bligh(t) against human rights from happening in your neck of the woods. May we see a domino effect in all other states of this country and after that any country which still provides this poisonous cocktail. Well done council! this a great result. you've made my day! Great work, great article! Thanks on bealf of all of us at www.facebook.com/fluoridefreeaustralia .You give the rest of us hope! Hello from Canada, congratulation you guys for achieving this marvelous victory. We are trying very hard in Canada to stop water fluoridation, as it is costly, a poison, and is not effective on tooth decay. Awesome win re Fluoride Werner !! Now hope ALL states follow suit !!! Good work, Werner, for exposing the fluoride proponents amongst us. This is a common sense victory for Cairns as well as the Atherton Tableland. We have a farm in the Wondecla area, and we raised four children. We have bore water and tank water, but we drink only tank water as the bore water has calcium fluoride in it and a tendency of giving you brown teeth. Our family, despite never drinking fluoridated water have perfect health teeth, due to brushing our teeth after every meal and a good health diet. 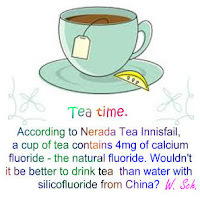 This debunks all the rubbish our Queensland Health officials preach ad nauseam; namely that silicofluoride in the drinking water prevents tooth decay – they must still believe in tooth fairies. An excellent report to read, Werner. Thank you for sending it to me and thank you for all your hard work. Many collective voices speaking the truth in their own way can make a difference. The difference is of course to get the blind willing to honestly look at the material. The blind followers should think about why there are so many voices speaking out against the poison. That in itself points to the fact that so many cannot be wrong. But,there are still many that do not bother, are unwilling to or have an ulterior motive to be open to the truth. That glares in your report. One day the financial pay offs and financial gains that have gone towards keeping the poison there for so long may well be exposed and dealt with!!. Quite a contrasting story for the opponents. Lots of personal funds have gone towards the fight. Thousands of dollars this end! What a sweet victory!! May it be repeated over and over again!! The truth cannot stay hidden forever. Cairns is showing us that. Cairns also is showing that the fight is absolutely worth it!! Go our fighters!! Good on Cairns Regional Council having the brains to stop hazardous waste pollution of the drinking water & hence also the entire food chain. It is a good job by all as I was shocked at the blatant pro-fluoride stance of the Cairns Post paper and so many others rarely publishing the truth of the harm and failure of water pollution/fluoridation. I believe this is all smoke and mirrors, they don't have to have millions to remove the 'fluoride' - they just have to stop adding these hazardous waste pollutants known as 'fluoride'. To all those complacent, gullible and trusting people who think 'fluoride' is great - do your own independent research - you will discover you have been fooled - the 'fluoride' added to our drinking water supplies and hence also contaminating the entire food chain is in fact, dangerously corrosive hazardous waste pollutants (from phosphate fertilizer manufacturing) fluorosilicic acid/silicofluorides and co-contaminants of lead, mercury, arsenic, cadmium, etc., and also added to that hazardous waste soup is aluminium sulphate. Added to this fraud of fluoridation is the fact that Australia wide is in dental crisis after decades of fluoridation first commencing in Beaconsfield Tasmania in 1953 and also the USA is in dental crisis after 67 years of water fluoridation first commencing in Grand Rapids, Michigan in l945 and yes Grand Rapids is also in dental crisis. In addition we are suffering crisis of Alzheimers Disease and Kidney Disease - don't put any more of us at risk by having this potent neurotoxic soup in our drinking water and hence through our entire food chain. Hazardous waste pollutants have no place being dumped into the drinking water supplies using the populations' kidneys as hazardous waste disposal/filtration units. Water fluoridation not safe and not effective and must be banned urgently and irrevocably for all our sakes. The only answer ever was to provide access to affordable dental health care services for all the population.